From RW - Capshaw. 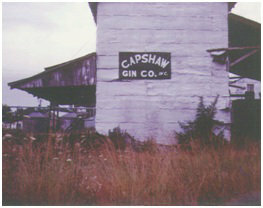 Photo was taken by Thomas David Capshaw of Houston, TX in 1960 (the gin in AL is no longer there). • "By 1810 he had moved out of North Carolina and into Indian territory. (1) Ruth Luallen on December 20, 1800 and Ruth died in 1802 (birthdate unknown). • Capshaw History - Capshaw Family History by Jerry Capshaw, © 2007-2010. • David's Bible - Lists the births, marriages, deaths. Page owned by Jerry Capshaw © 2000. • Family History - Roots Web - The Capshaw Family History. Along with genealogical information there are family stories recorded here. Page owned by Jerry Capshaw � 2000. This page was last modified on 1 September 2012, at 16:23.